It’s been a couple weeks, since the new interns Jaimie and Emmeke have started their internship with us at SNUBA SXM. The girls started their internship in December, which meant they were going to spend their Christmas holidays here. As a gesture to give them a proper friendly Sint Maarten welcome, Mich and Kelly invited them to join the team for a Christmas dinner and take them out for a Champagne Brunch on New Years day. It was a lovely time where we could get to know each other better and include the girls as part of our new team. Kelly had made a wonderful dinner, which we all enjoyed on their terrace. For New Years we went to The Westin Hotel, where we indulged in a Champagne brunch, with delicious foods and good company. After the holidays it was back to business. Jaimie and Emmeke started on their Rescue Diver training with Eva. They passed their written exams with flying colors and practiced different scenarios in the water. For their final exam the girls needed to rely on what they had learned and implement this as the rest of the team had prepared several emergency scenarios, that the girls had to respond to. Besides it being really fun, it went well and they handled all the emergency with care and professionalism. And just as they had let their guard down, Mark, one of the divers on the boat had jumped off to simulate a “man overboard” emergency where Emmeke and Jaimie had to take charge and handle the situation. Emmeke, being a fast swimmer, jumped in after him and towed him back to the boat. In all the excitement, Eva jumped off the boat as well, and Jaimie had to “save” her. Everyone got back on the boat safely and the exam was now officially over. And the girls can now call themselves Certified Rescue Divers! To celebrate Jaimie, Emmeke and Eva went out to dinner. So the next step in their road to Dive Master, is to prepare to be SNUBA GUIDES! This will be the fun part, where all of you (our guests) get to see the girls in action in the water leading the tours. They only passed their SNUBA theory exams a couple days ago! (Yay Interns!! ) The girls are busy preparing to bring all the knowledge they have soaked up over these past weeks, watching the Guides closely, into practise and soon they will be leading their first tours. So stay tuned and watch our interns become fully certified SNUBA Guides… Or better yet.. Come see in person and book a tour with us today! 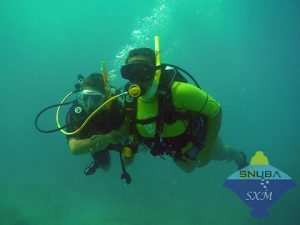 SNUBA SXM TEAM. This is the whoile team, including freelance Captains and SNUBA Guides.